It is a checklist filled out on all children in kindergarten that was developed by the Offord Centre for Child Studies at McMaster University in Canada. 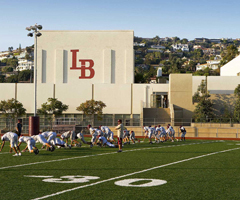 The Children & Families Commission of Orange County, which invests in programs and organizations to ensure that all children in Orange County are healthy and ready to learn when they enter school, is leading this effort in partnership with the UCLA Center for Healthier Children, Families and Communities. 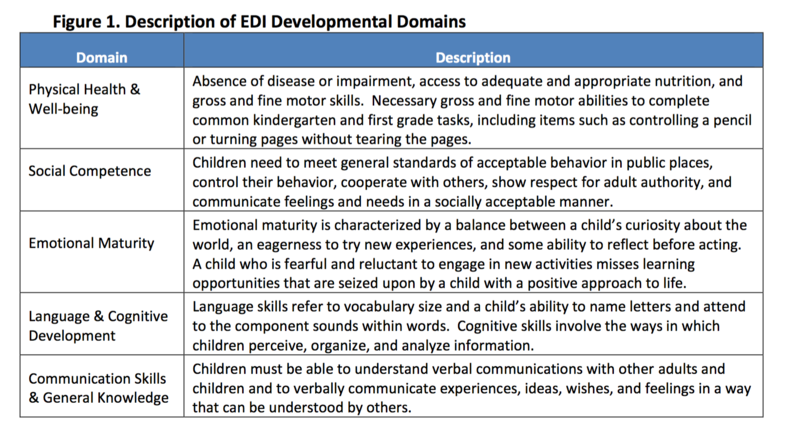 The EDI includes five key domain areas (described in Figure 1) and is used to produce holistic, community-level measures of childhood development during the kindergarten year. The EDI identifies the percentage of children who are vulnerable and on track by developmental domain and compares this information by target community. The EDI is not designed to screen, identify or diagnose individual children. The EDI can be used to monitor populations of children over time, report on populations of children in different communities, predict how groups of children will do in elementary school, and inform policies concerning young children and their families. How are EDI data interpreted? This report depicts the percent of children “not on track” and “on track” in your district by the five developmental domains. Children are “not on track” in a domain if their mean EDI score for that domain falls at or below the 25th percentile normative cutoff. Conversely, children are “on track” in a domain if their mean EDI score for that domain falls above the 25th percentile.